According to a recent article in Eos (Doran and Zimmermann, ‘Examining the Scientific consensus on Climate Change‘, Volume 90, Number 3, 2009; p. 22-23 – only available for AGU members – update: a public link to the article is here), about 58% of the general public in the US thinks that human activity is a significant contributing factor in changing the mean global temperature, as opposed to 97% of specialists surveyed. The disproportion between these numbers is a concern, and one possible explanation may be that the science literacy among the general public is low. 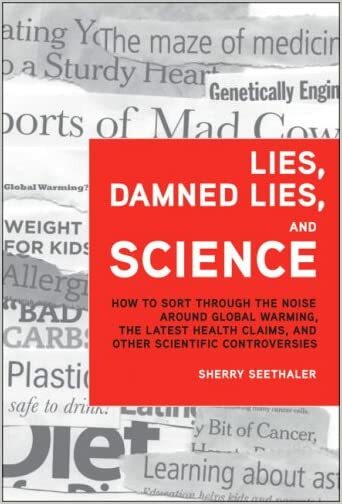 Perhaps Sherry Seethaler’s new book ‘Lies, Damn Lies, and Science’ can be a useful contribution in raising the science literacy? Every so often people who are determined to prove a particular point will come up with a new way to demonstrate it. This new methodology can initially seem compelling, but if the conclusion is at odds with other more standard ways of looking at the same question, further investigation can often reveal some hidden dependencies or non-robustness. And so it is with the new graph being cited purporting to show that the models are an “abject” failure. There was a great comedy piece a few years back (whose origin escapes us) that gave examples of how the English would use their language when speaking to a non-native speaker to imply the precise opposite of what was actually being understood. This allowed the English to feel superior without actually damaging international relations. One example was the phrase “with all due respect” which is generally understood to imply that the speaker has a great deal of respect for their counterpart, while the speaker is actually implying that they have no respect in the slightest for their interlocutor. The respect due being precisely zero. There is a new paper in Science this week on changes to atmospheric visibility. In clear sky conditions (no clouds), this is related mainly to the amount of aerosols (particulate matter) in the air (but is slightly dependent on the amount of water vapour as well, which is corrected for in this study). The authors report that the clear-sky visibility has decreased almost everywhere (particularly in Asia) from 1973 to 2007, with the exception of Europe where visibility has increased (consistent with the ‘brightening trend’ reported recently). Trends in North American stations seem relatively flat. There is another story that didn’t get as much press when it came out late last year but that is highly relevant to this issue – whether any of the efforts that the Chinese authorities to reduce air pollution ahead of the Olympics last year had any impact. To the extent that they did, they might point the way to reducing aerosols and other pollutants across Asia, but it might also reveal how hard it is to do so.